» Why Hello There, American Walnut. How To Gel Stain An Embossed Fiberglass Door. Remember when I posted about my hopes for a front entrance makeover? Before I get started, let me remind you how our door used to look. Of course from this distance everything looks peachy, but up close you can tell the paint is scratched and just plan rough (this picture was taken in 2008). In order to get the payoff in the end, you have to do something a little wacky first. Like painting your door an odd shade of yellow. Pardon the creeper cat appearance. Here’s a truer color shot from the inside. In case you want to run out and paint your door this color, it’s “Glazed Pecan” by Behr, color matched to Glidden Exterior Flat. This is a great way to give your neighbors a heart attack, by the way. Not that I hate yellow- that’s not the case at all. It’s just this particular shade combined with the colors of the house…well let’s just say I almost put up a sign saying it wasn’t permanent. In any case, I kinda took a gamble with this color as the base. After doing tons of research, I had seen taupe, ochre, and everything in between used under the stain. For some reason, this color jumped out at me from the sea of swatches. Since my door was cranberry on one side and white on the other, I knew I needed a clean palette for both sides and took a chance on this more-butterscotch-than-pecan color. Sidenote- now is a great time to paint your hardware. Krylon Oil Rubbed Bronze strikes again! Now the fun starts (and the sighs of relief!). In order to get the most realistic and natural effect, you’ll want to stain in sections. Start with any raised panels and then do all the vertical grain, followed by the horizontal grain (you can reverse the last two). Use painter’s tape to mask off the sections at the joints. When I read that gel stain is literally fool proof, I was doubtful. But, it totally is. All you have to do is take your brush, dip it into a TINY amount of stain and brush in the direction of the grain. It goes on very dark and opaque. I brushed about a 6 inch area then wiped it lightly with a rag in the direction of the grain. Then I went back with my mostly depleted brush and feathered it with the grain. You’ll want to move quickly, but don’t panic-you can always brush more stain on and try again. Some of the base paint color should show through. Don’t try to get perfect coverage the first time, I think the layering lends to a more realistic effect so shoot for two coats. I moved on to sides of the door, the outer edges of the raised panels, then the window frame. Finally when those areas were dry, I was able to tape around the horizontal planks. By the end of the first day, I had a really impressive look already! The next day I began the process again, doing each area in the same order. I’m really happy with how it turned out! 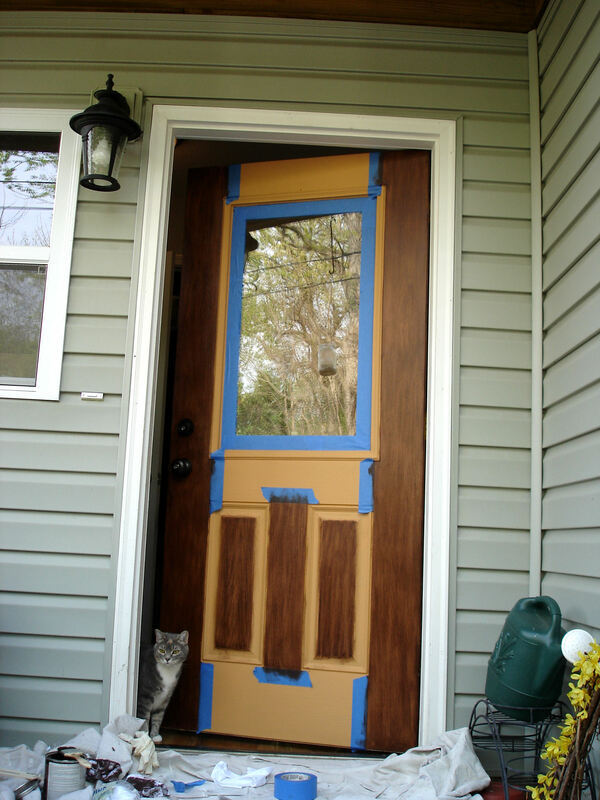 Try to ignore the blue tape, the inside of the door still needs a second coat (it wasn’t quite dry this morning). This is really important: even though the can says you can recoat in 8 hours, DO NOT do this if the surface is tacky at all. I know this the same way I know most of what I tell you- I’ve been there, done that, and messed it up. After completing the outside of the door, I began on the inside but the new stain was rubbing the old stain off. Not good. Patience is a virtue. I figure it was more hot or humid in here than outside. I still have to poly the door on both sides when the stain is dry, then I’ll start on the upstairs door and the shutters. Pretty soon, I’ll convert our cranberry madness into classic American Walnut! Have you guys ever done this? Would you be willing to try? Have you used gel stain for other projects? Another great project! I scheduled a feature this morning. WOW!!! Can you come do my door?! Absolutely Love this! Can’t wait to try this on our new place! Especially the barn… which is painted a really odd/sort of barfy (not technically a word, but properly descriptive) color. ;o) Thank you for sharing this wonderful idea! Do you know if it will work on a metal door? That’s fantastic. I can’t wait to show my husband these pictures. We just put up a new garage, and right now the doors are bright white. wow! That turned out absolutely amazing! That’s a HUGE transformation (and who would’a thought you’d have to paint the door yellow to do it… crazy!). Seriously, NICE JOB! WOW!!! That worked so well!! I have a post scheduled for next week that shows the front door on our new house… Once you see it, you’ll see why I LOVE THIS POST so much! Our new door needs help! This is fantastic!!! you did a great job! This is amazing! I was scared hearing that you were going to do this. After all it is the front door. I loved the first coat but the second coat was fantastic. I can’t wait to see after the poly coat. And the inside too. Thank you so much for sharing. Have a great day! It looks fabulous! I love how it turned out! Holy wow, that looks completely amazing! You did a fantastic job. What a transformation this was, I love it! Our front door is steel with a large oval window. How do you think this would like since it doesn’t have the wood grain? I really like your door! 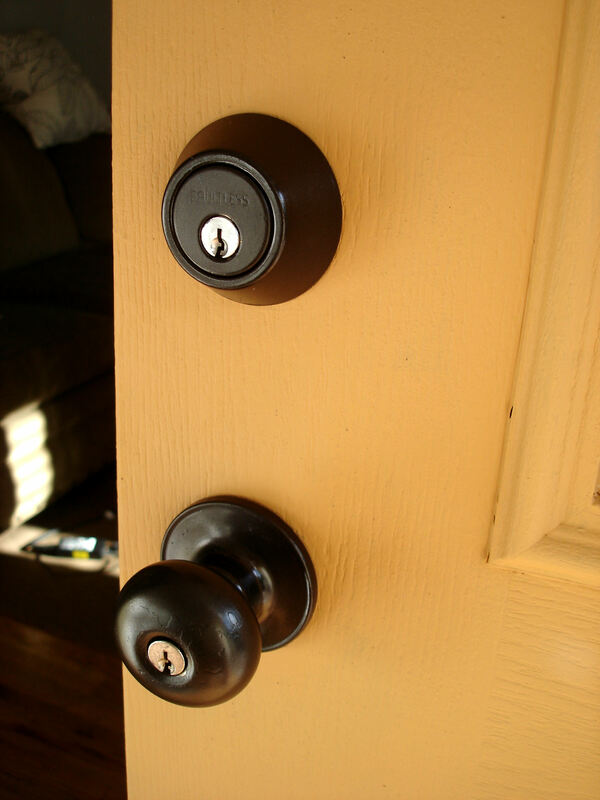 Brandon- I actually did this method to my upstairs door as well which doesn’t have wood grain and it looks great. 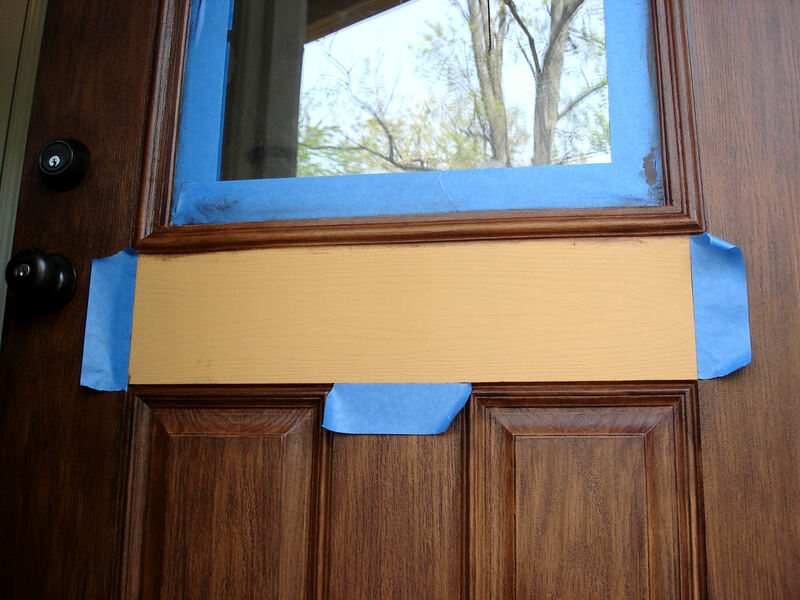 I would recommend taping off the door in the same manner to create planks, and you could try a wood graining tool to make it even more realistic. That looks absolutely fantastic! I am amazing by the transformation, you are awesome! 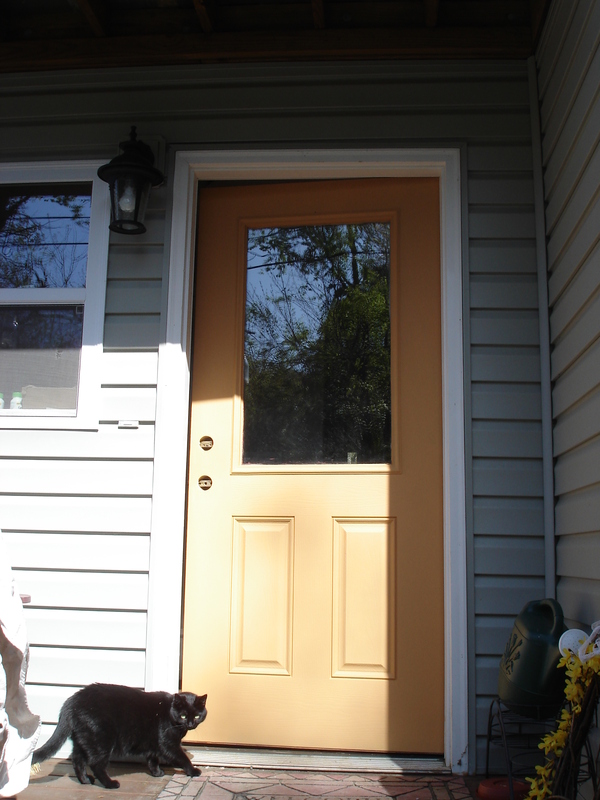 Is the process the same as you did it if the door needs to be refinished? Marilyn- Is the door solid wood? If that’s the case, I would just strip it and re-stain. This process is really geared towards making fake wood doors look real. Not that you couldn’t use it on a real wood door. I have a stained fiberglass front door that has started fading. Do you think I can use the gel stain directly over the old stain? Do I need to paint it first?. It has some sort of finish over the stain and I know that I can’t sand the fiberglass so am wondering if the gel stain will stick. Did you paint the interior of the door with flat paint? Looks awesome!! Did you also do that to the inside of your door?? Hello! Great project, looks fantastic! I am thinking about attempting it myself, but I want to ask: how has this held up since you did it? Has it chipped at all? The door looks great! What finish polyurethane did you use? Was that a satin? Thanks! Laura- Are you planning to use the same stain? I would go with the yellow still, as I’m not sure what the color outcome would be otherwise. You are a life saver!! I gel stained the interior part of my front door over the existing stain and it came out beautifully. However, the outside was terrible. It was flaking and once I scaped of the top coat, it wasn’t the same color. So, you can’t put stain on top of that because the finish looks awful. So, I took your idea and painted the exterior portion in “latte” an acrylic flag exterior paint by sherwin Williams. Waiting for it to dry so I can carry on with my staining! I can’t wait to see the finished product! Thanks so much!!! I fell in love with your door, so I decided to do mine. It has been 1 1/2 days and I still have a tacky door. I can’t do the second coat. Is this normal for it to still be tacky? Is it humid where you are? I’d wait another day and then do the second coat regardless. Just make sure you’re doing thin coats. It is pretty humid here in Minnesota. I did my second coat today. It looks awesome! Now it just has to dry! thanks for the inspiration, you rock!! Just found your site. Love what you did with your door! Would this work with a white fiberglass door as well? I am needing to replace my door between my family room and garage and want to stain it to match the wood on the inside. Great job, so you mention depleated brush, what do you mean? So did you use latex paint to paint the door the yellow color? Will gel stain adhere to latex?  Hi Shannon – yes regular latex paint! Gel stain is very versatile and sticks to nearly everything! Looks fantastic! Just have a quick question! My door is wood and is painted white. After I strip it could I just stain it? Or do I still have to paint it yellow first? Thank you so much! You could go right to the stain if your door is wood and you’re planning to strip the white paint. 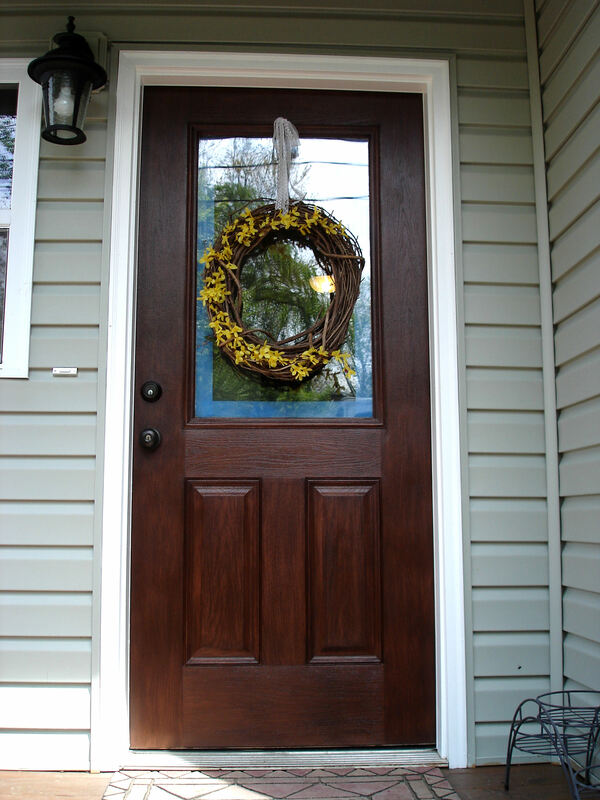 Where did you purchase your fiberglass embossed door? I love this idea! We can’t afford the wood door that I want, this is a great compromise! Hi Ashley – Sorry I don’t know – it came with the house lol 🙂 Good luck! Absolutely love this. How is it golding up after all these years? Pretty good all things considered!! It has faded some, but no peeling. It does get quite a bit of sun. 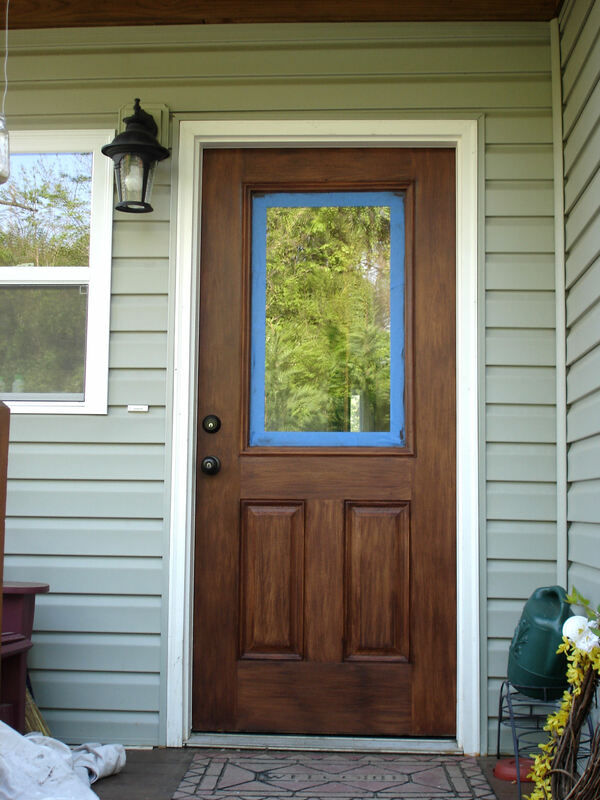 You can get a primed wood textured fiberglass door from Lowe’s, Home Depot, Menards, or even online from a builder supply. They also make them in smooth but ask for the wood textured. These are usually contractor grade doors and run probably around $300. If the doors are not on display then they will have books and you can special order one. 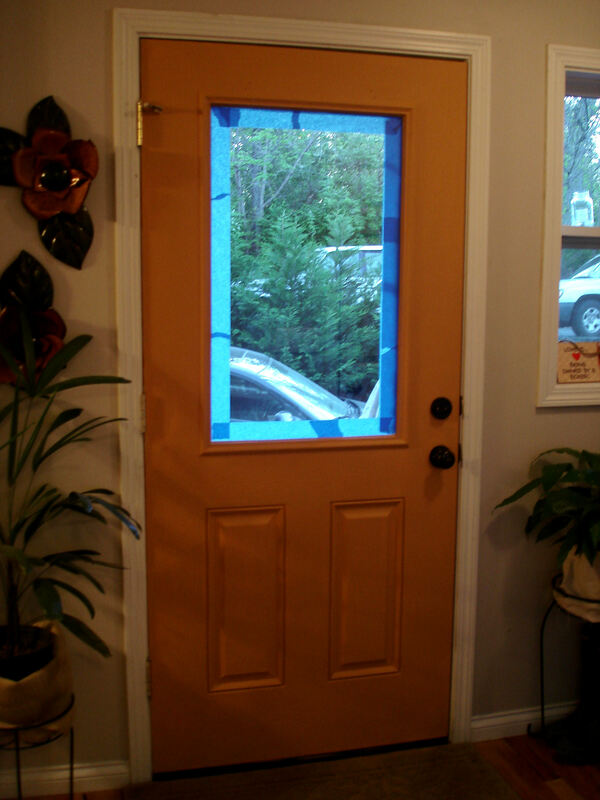 Of course, they do have really nice finished fiberglass doors that look like real wood but those are $$$$$. Another option is to hit a Habitat for Humanity ReStore. They always have fiberglass doors that people donated! You can walk away with one for $20. Good luck!! 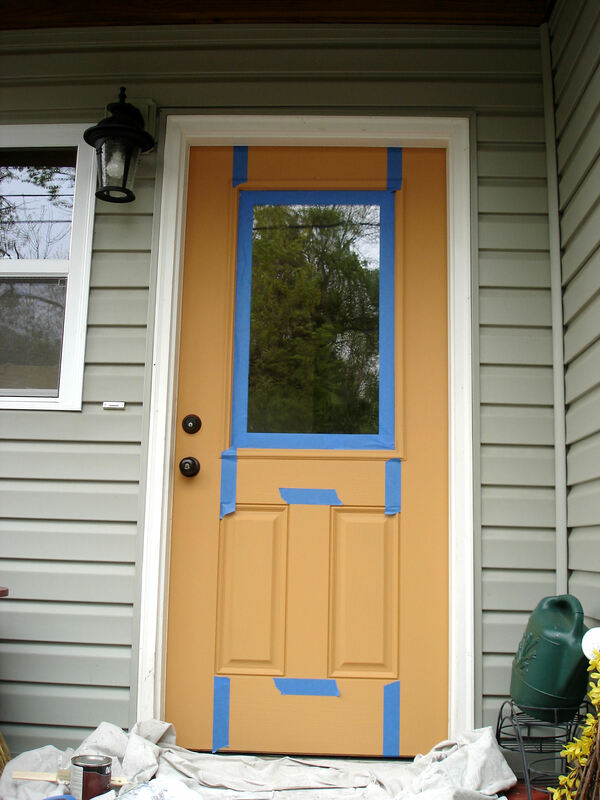 Did you have to do any special prep to the door before you applied the coat of paint? Stripping any old off, etc. Yours looks fabulous. Also is it still holding up to the weather. Mine is only 3 yrs old but the morning sun is murder on the stain job and is pealing. Hi Alex – I cleaned it well and gave it a light sanding – it had already been painted before, so the paint stuck to the old paint. It has faded some with the sunlight – I think that’s normal. Eventually I’ll probably need to re-do it. I just did this today!! My door was red, so I kept the red and did the stain in Walnut. My door looks like a very pretty cherry wood finish. I absolutely love it!! Thank you for the tip! I did this on my front door and thought about doing my kitchen cabinets the same. My question is they are currentry painted with a flat latex brown. Would it be best to completely sand that off down to the base or do you think I could lightly sand and then paint and stain over it? Hi Lindsay – If you truly want a wood stain look, and your cabinets are wood, I would sand as much as possible through the paint. But, you could always try it right over the paint (degrease first) and see how it looks before sanding everything, you know? Just curious, did you faux the inside door as well? How did it turn out? I’m doing both and still on my first coat of paint, trying to decide if I should continue the inside door or paint it back to white. Hi Nicki – Yes I did! It’s actually still in great shape – much better than the outside part since it never gets sun 🙂 Same exact method as both sides of my door have the woodgrain stamping. Rachel, thank you so much for posting this. I am excited to try it. I have my door coated in the ugly golden/orange flat paint now. My question is about the hardware. Did you paint your door knob with spray paint??? Did it hold up??? Hi Jen – I did spray it, and it held up for awhile but we eventually replaced the whole set. I would advise that you scuff up the surface very well with sandpaper and do a few thin coats of spray paint. Finish with a paste wax if you can, that should help. Hi! I’m planning on trying this with my front door and I’m not sure how much stain I need to buy. How big of a can of Old Masters American Walnut stain did you end up using? Is a pint enough to one side or both sides of a door? Hi there. I gel stained my garage door about a month ago. 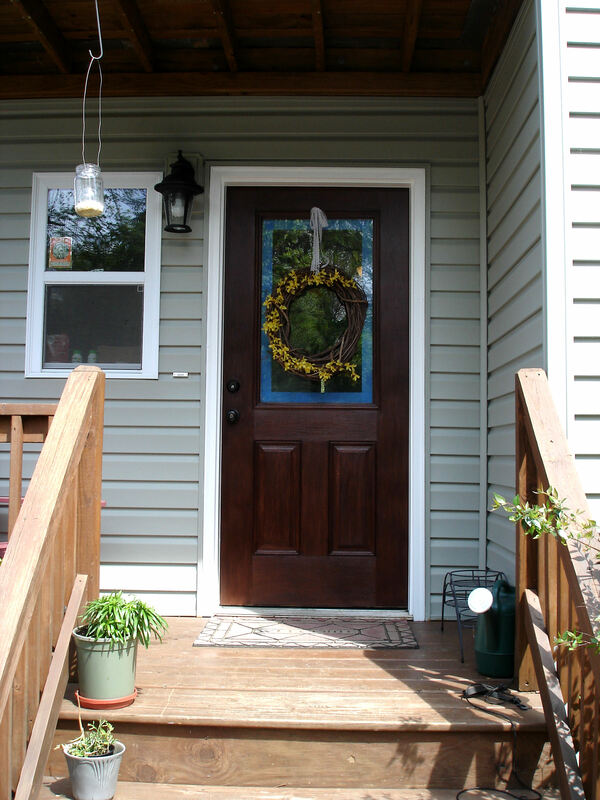 I’ve been considering doing my front door and the one set of outside shutters.Did you finally do your shutters too? If so, did you like the look? Yes I did my shutters too! It made a huge difference and has lasted really quite well despite constant sun exposure.